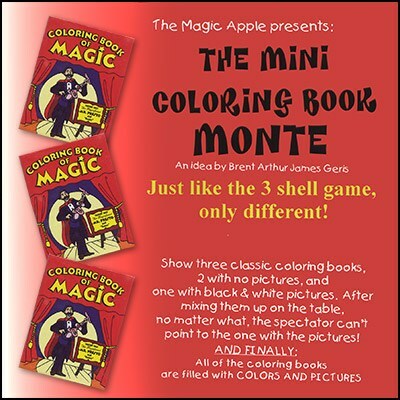 You show three mini coloring books - two with no pictures and one with black and white pictures. The one with pictures is in the middle. You move them around, and then have the spectator guess where the coloring book with pictures is. They are wrong. You repeat the steps again. Yet, they cannot seem to choose the correct book! Finally, you ask them to bet a buck. After shuffling the books around very slowly, you ask where the one with the black and white pictures are. BUT NOW ALL THREE COLORING BOOKS HAVE FULL COLOR PICTURES!! Includes Three Mini Coloring Books and Instructions.